Happy Labor Day! Oh, do I ever love three day weekends now that I'm a workin' girl! Drew has been out of town with a friend & family ... Allie has been on the go all weekend ... John, of course, is always willing to give me stampin' time! I got a whole lot of stampin' done on Saturday and Sunday ... today is reserved for household chores and errands that desperately need done. Last night, I was able to play along with Beate's Weekend Sketch Challenge #55. I used the stamp set Enjoy Every Moment, and the new Haiku Designer Paper ... using the colors Tangerine Tango, Old Olive, So Saffron, and More Mustard. This card measures 6 1/2" x 3 1/4" which fits Stampin' Up! Small Open-End Envelopes. 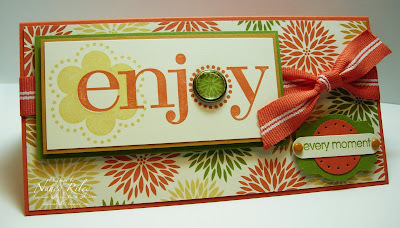 I used the Stamp-A-Ma-Jig to line up the stamped So Saffron flower and the stamped Tangerine Tango "enjoy". A 1/2" circle was punched from the Haiku DP for the Build-A-Brad, and the layering of the "every moment" sentiment include the Designer Label Punch, 1" Circle Punch, and Word Window Punch ... along with More Mustard Brads and Paper Piercing. Oooh, this is fabulous!! You just made me want to pull out my Enjoy set again, it's been a long time for that one! Hmmm, and you keep making me add more designer paper to my wish list!! Looks great! I'm glad to see you were able to get a whole lotta stamping done over the weekend!! Love how the "e" fits perfectly in the center of that flower! it's a beautiful card. I like the colors. Have a fab week at work my friend! love what you did with Beate's sketch! the enjoy every moment set is awesome with the Haiku dsp! your greeting tag in the bottom corner is soooo clever, too! And...I'm with you on the three day weekends:)...one of the perks of working in a school, huh? A beautiful card, very seasonal! Girl...everything you make is outstanding! This is wonderful!! I love that paper. Beautiful as always! Glad you are able to enjoy the three-day weekend. Oh my goodness! I absolutely love it! It's gorgeous. I am glad you had time to play. I love your work! You have worked Beate's Sketch fabulously. Love your choice of Stamp Set too!!! OOhhh, yummy colors! Love what you did with the sketch! Looks like you got a lot of stamping time this weekend! This card is beautiful, Nancy!! Thank you so much for being a great inspiration! Great use of this print in the Haiku pack! Beautiful card! I am loving the little medalion in the right hand corner... I will add it to my have to make list... Great card!